Last Saturday, I took a one-day class on lino-cutting at The Village Haberdashery with Karen Lewis. I adore Karen's work and admire not only the way that she prints fabric, but also the way that she combines colour in the things that she makes with those prints, so the moment I discovered she was teaching in London, I signed up. I've also known Karen online for nearly a decade now, so the opportunity to finally meet her in person felt like a lovely prospect! 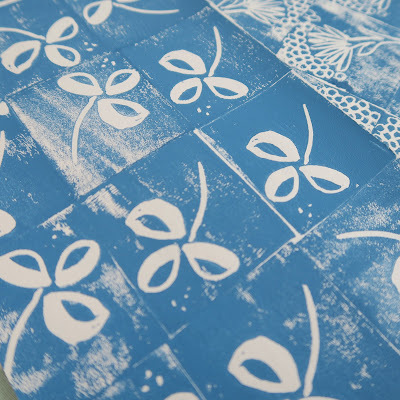 I have a fond memory of lino-cutting at school in an art lesson many years ago, although it was quite different to what we did on Saturday. 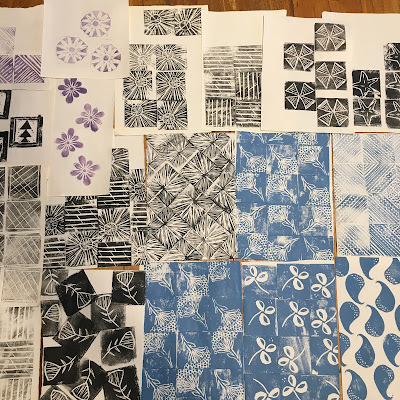 At school, we used very hard-to-cut lino and employed several different colours, doing more cuts for each new layer of colour that was applied. I remember enjoying the process, but not being overly thrilled with the murky red and green leaf that I produced. To tell you fully about how much I enjoyed Karen's workshop though, I feel I need to rewind the clock by twenty-four hours first, because it was a magical few days all round. At 7.30am the morning before, if you had zoomed in on my whereabouts, you would have found me scurrying through London under the weight of vast quantities of baggage, and leaping (as much as one can when fully laden) onto a bus alongside my sister, who was carrying her pillow and her gorgeous 38-week-old bump, all ready to give birth! (Just in case you're left wondering why she was carrying a pillow: London hospitals seem to ask you to bring your own when you're having a baby, probably due to them being in short supply). My own children aside, I'd never imagined experiencing a birth firsthand, so it felt like such a privilege to be there as my beautiful little niece came into the world. Although I had known I would adore her, I was unprepared for being hit with such an instant rush of love, and feeling of relief, the moment I saw her face. I forgot everything on the list of things that I was meant to be tending to at that point (such as taking photos or cutting the umbilical cord), and instead my face was awash with tears of joy and general snottering over my sister, whose eyes were similarly dewy. I'm not sure I have the words to express what an emotional day it felt or how much it affected me afterwards to have witnessed that moment where a child - one whose safe arrival I felt so invested in and such delight over - goes from being on the inside to suddenly being on the outside and a real known entity, breathing independently - it felt unexpectedly vast and as though it has subtly shifted my sense of the world in a way that I don't entirely understand. 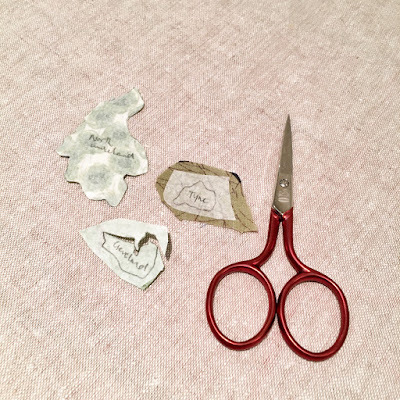 I felt similarly when my own children were born, but more fleetingly, because there were so many other things - emotional, physical, hormonal, practical - fighting for a place when it was my own new baby. This has stayed with me and even a week later I find it drifting into my thoughts and leaving me feeling slightly awe-struck with wonder. Doing anything other than either being with my sister or having a very, very long sleep the next day felt like a surreal prospect, but I'd booked onto Karen's lino course a few months earlier and I was keen to still go and our mum was enthusiastic to spend the day at the hospital, so we arranged to go into London together early the next morning (although when my alarm went off at 6am after only a few hour' sleep, I was horrified, which is totally unlike me as I'm a pretty good morning person. I have Sunday Morning by The Velvet Underground as my alarm and I'd always previously felt it would be impossible not to feel quite enthusiastic about getting up on hearing those sparkly opening chords...I've now realised that there is a tiredness that even that song will struggle to jolly one out of). 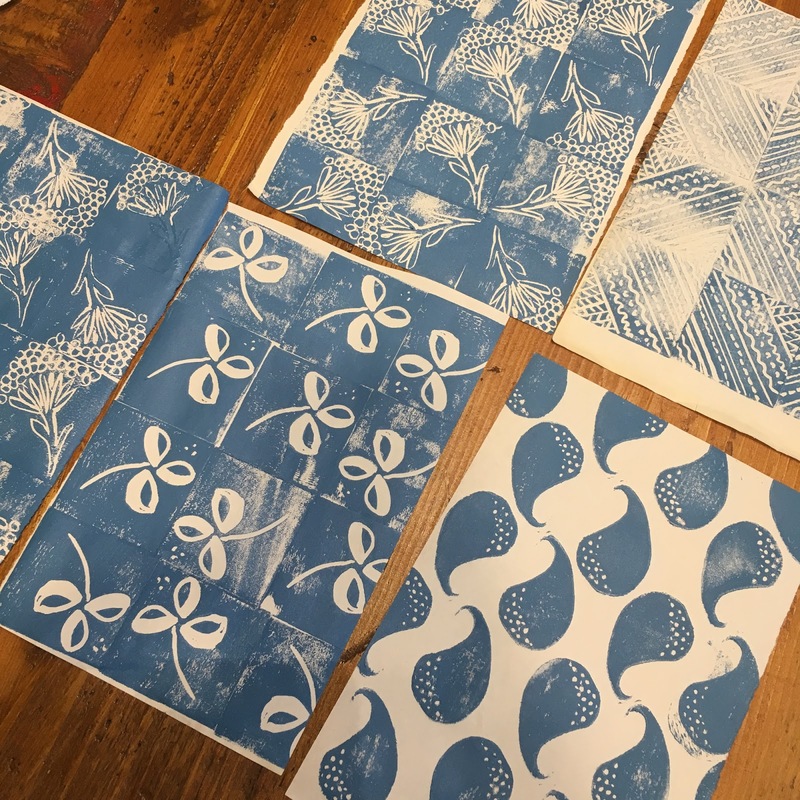 But actually, pulling myself out of bed was so worth it and a day lino-cutting with Karen ended up being the perfect post-birth-partner activity and now feels like an integral part of the general magic that hung over that weekend for me. In the sunny studio at The Village Haberdashery, we got to work using our new tools straight away and we found that the lino Karen uses is much softer than what we'd had at school, which had felt more akin to chipping away at a thin layer of concrete. 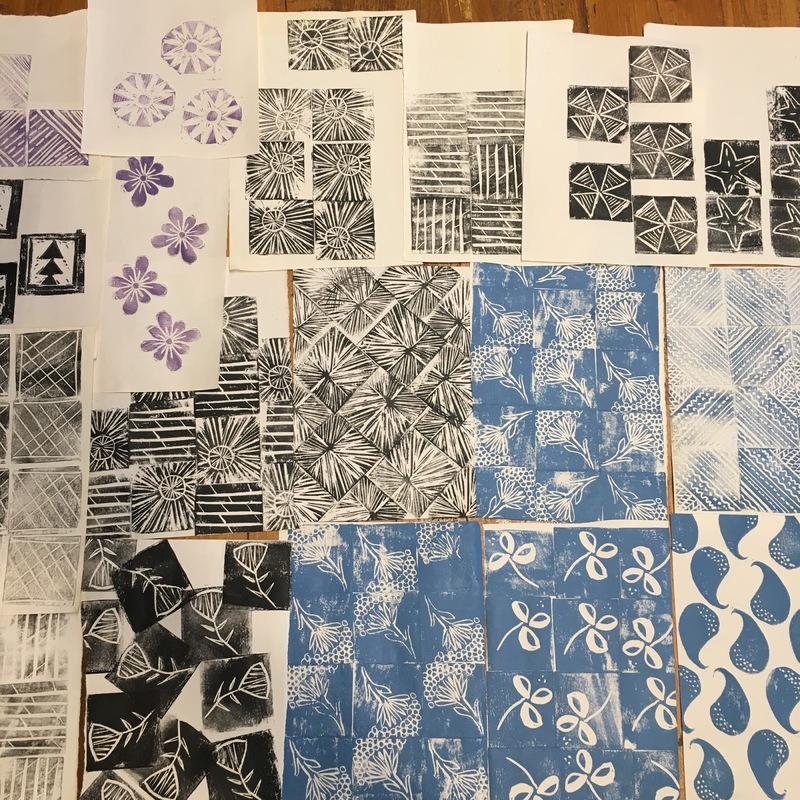 We divided our lino into six small pieces experimented with what each of the different lino-cutting blades did by making lots of lines. 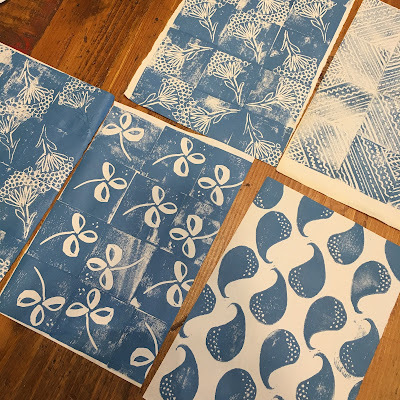 Karen encouraged us to print onto paper at first, rather than our cotton, so that we could experiment before committing to fabric - this was such a liberating idea and I think only two of us had ventured onto fabric by the end of the day (neither of those two being me). I began by placing my block in orderly rotations to produce the same purposeful fussy-cutting effect that I'm often drawn to do with my sewing (above), but there's something about Karen's easy, confident approach to experimentation and her enjoyment in what emerges with a less intentional approach, that's infectious and I soon found myself breaking out of my usual way of working and liking the results of my experimentation all the more for it. 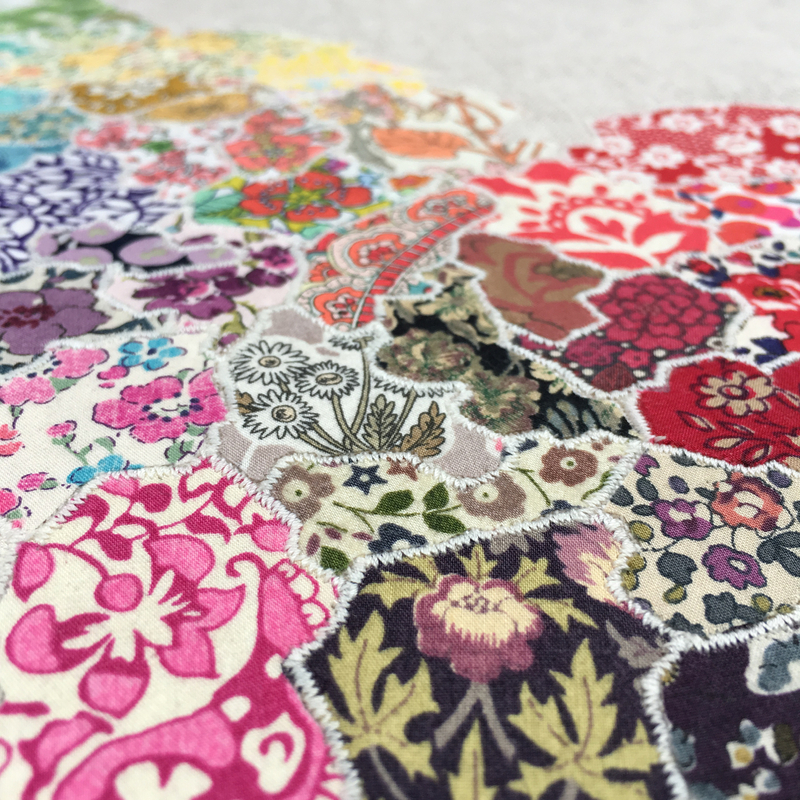 This photo, below, shows all of our work together at the end of the day - there are so many prints in here that I love - particularly the central black fireworks and the bottom of the purple sheets which has a beautiful flower motif. It was a very hands-on day, with little time where we were sitting down just listening, but I learnt so much and we were all naturally drawn to frequently gather around each other's work as Karen discussed how something was done or the different effects that we might consider to experiment further. All of us had very different styles, which meant that it was easy to be influenced by what others were doing, with little chance of producing something that looked the same. 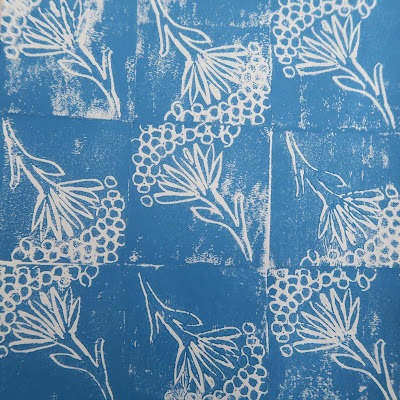 It was a lovely group of women and there was plenty of time for quiet chatter as we sat carving our lino and I really enjoyed that aspect of the day too (it's a different kind of conversation that you have when your hands are busy, isn't it, somehow more relaxing). By the time we began to pack away our supplies, I can only compare how I felt to how someone may feel at the end of a day at a spa - totally refreshed and invigorated, but with that warm fuzzy feeling of also being utterly relaxed (I don't really enjoy spas, but clearly I've found my alternate version of one). 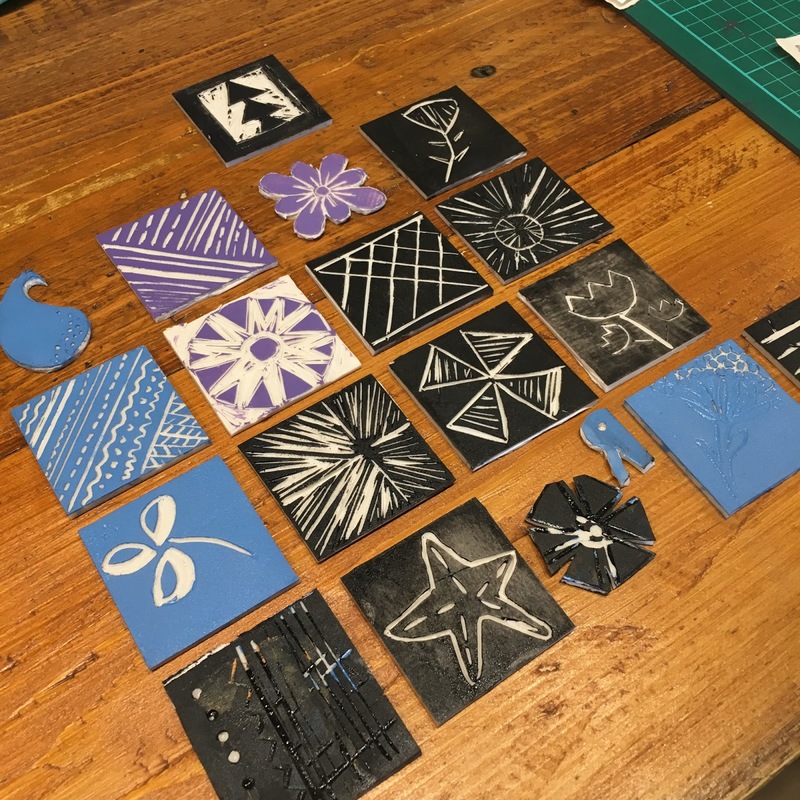 Above are the lino squares that we cut during our class. If you get the opportunity to be taught by Karen, I'd recommend you waste no time in snaffling up a place - it was such an inspiring day. She is a warm, knowledgeable and hugely enabling teacher. After the class, I went back to the hospital for a quick cuddle with my sister, niece and mum and then raced home to meet up with a group of our friends for a celebration Christmas dinner...I can't remember much of it as I felt an underlying tiredness by that point that manifested itself as feeling akin to being on a boat where I had the sensation of gently swaying, even before having anything to drink, but it's represented in my head by a warm glow of smiley faces and a vague awareness that I was fresh off the train wearing jeans and the odd fleck of paint, while everyone else had beautiful dresses on (not the men), but that it didn't really matter. This week, finding I needed a specific fabric but had nothing in my stash with the right background colour, I suddenly realised that I could just make some. I know that's the obvious outcome of learning to lino-cut, but it hadn't occurred to me that I'd actually use it in practice (sometimes I don't think all the dots in my brain automatically link up in the way that they should...I imagine my brain is like a giant dot-to-dot, where it frequently dashes from number 5 to number 21, missing out a whole rabbit's foot or flower petal as it does)! 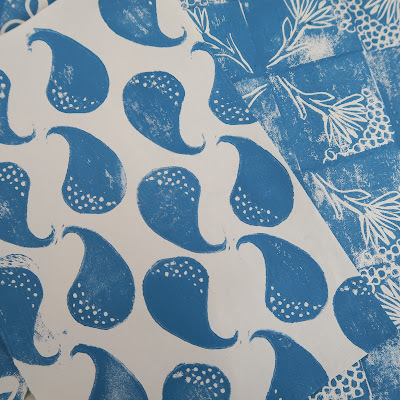 In my chicken-no-egg scenario, I'd thought that I might print some fabric and then try and find a purpose for it, but not that I'd need some fabric and so just print some! Viewed from that way around, it feels like a truly exciting prospect. 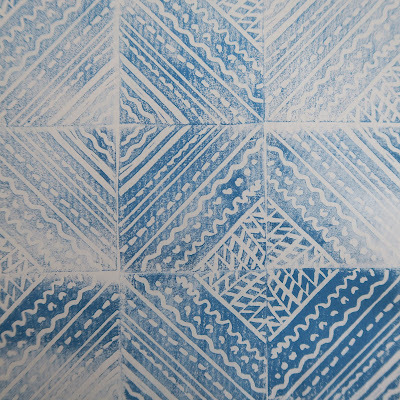 I didn't have as much time as I would have liked to think about the design, perfect the prints or trial quite how much paint is really needed when printing on cotton rather than paper, so there's much room for improvement, but I'm looking forward to showing you what I did in a few months' time, as it's part of something that I can't share just yet. How are you plans for Christmas coming along? We finally put our Christmas tree up this evening and I'm only a few people away from having bought all the presents (so in reality, probably still quite a lot to do, but I'm hoping I might solve some of that tomorrow). I talked a bit about the quilt that I used as the inspiration behind the blocks that I contributed to the V&A's new book here, but what I didn't mention was that I'd become completely obsessed with the maps that lay at the outer corners of the quilt. 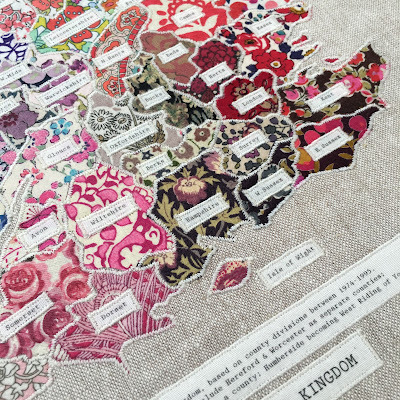 The photo below shows one of these maps - the maker had chain-stitched around each county and then embroidered its name on in almost impossibly tiny cross-stitches. 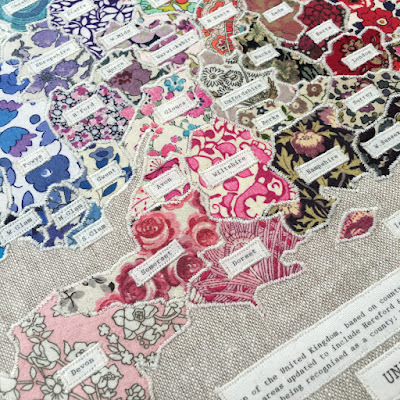 I fell in love with all the small snippets of colour pieced together like a jigsaw, although I also loved what the presence of these maps represented: that the maker was outward-looking; that she brought her education and her sense of her place in the world to her quilting...that feels no small thing bearing in mind that she was living in 1797, when women's access to travel and education would have been relatively limited. 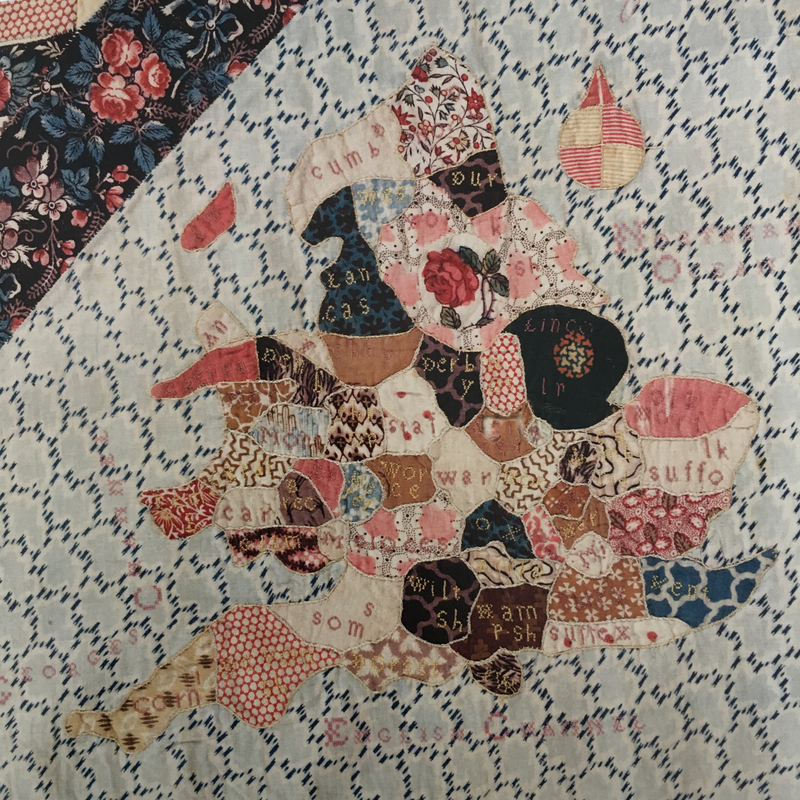 I've talked about it in the post I linked to above, but the structure of this quilt was interesting, with symbols of the maker's own world and domesticity placed at the centre - such as needles, scissors, a pin cushion; then moving out, the garden was depicted with flowers, ducks and birds; finally two globes, Scotland, England and Wales in the far corners of the quilt. 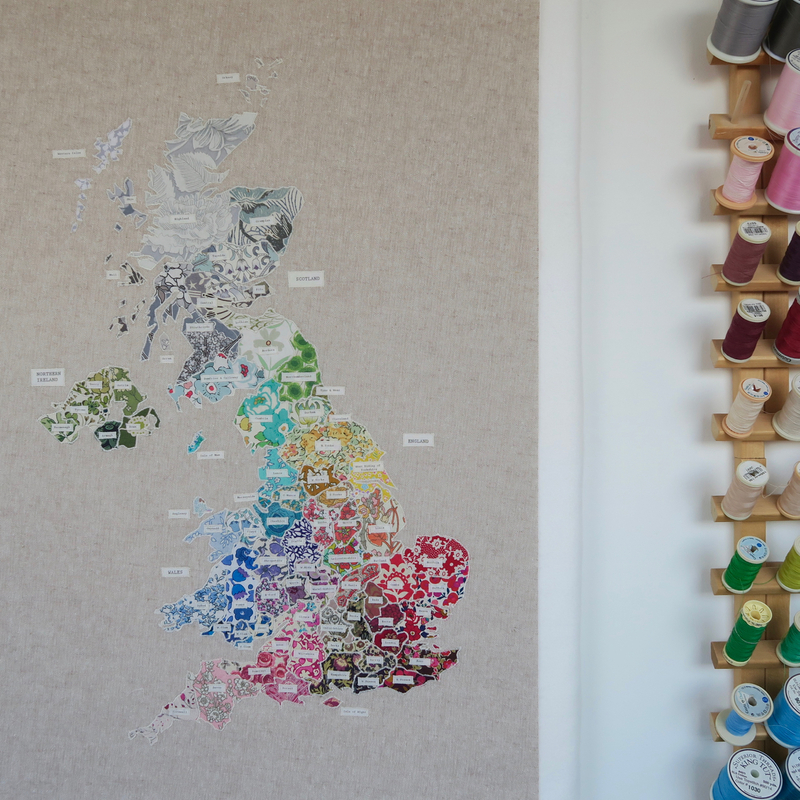 Since I first studied the details of the quilt last year, making a similar kind of map had been mentally added to my 'one day' project list, but it was an idea that bobbed back up to the top, even as the list became fuller - a sure sign of something that wants to be made, as it's so easy for ideas to disappear from sight entirely. Then, one night at a quiz - take from that, that I was sitting at a table with other people who were answering questions, while I ate the cheese they'd thought to bring along - someone said that their husband often spent time in the evening studying maps, looking at river names, mountain ranges and the myriad of tiny details that filled the page, trying to memorise it all specifically for boosting his quiz knowledge. You know when you first hear about a hobby and think: Wow! I had no idea that people did that. Well, that was what I was thinking as I cut a little more stilton to tide me over for the next round. 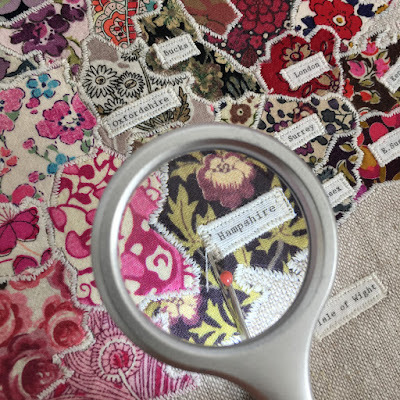 When I lay in bed that night and thought back to it, I suddenly linked it up with the 1797 quilter, who'd wanted to appliqué maps on her quilt...and in fabric-form, the desire to know and name and label made more sense to me. Deadline-based work recently cleared off my desk, I got up the next morning and started making a map. 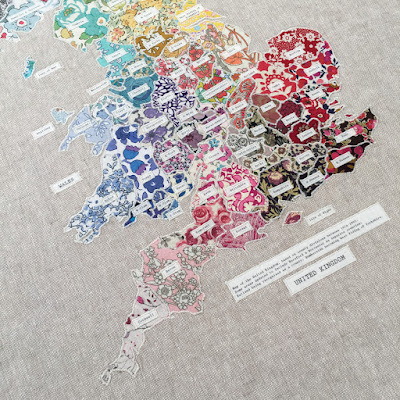 My initial idea was to fill each county with some kind of embroidered or woven fill, mixed in with the odd Liberty print, but it started to look slightly chaotic and I couldn't work out how the county names would show up over the stitched areas (I hadn't thought of printing them at that point, as I did in my final version, but that totally would have worked). The image you see below is where I got up to with that idea. 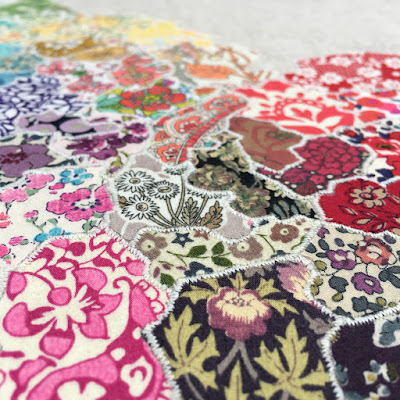 In the end, I decided to use solely Liberty Tana Lawns (it's probably predictable that I'd decide that, but it came as a revelation to me at the time...Oh, I could just use Liberty prints! What a novel idea. 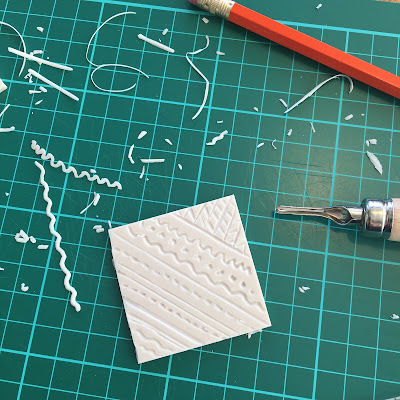 But really, the scale of them works so well for tiny pieces like this, so it's predictable, but also really sensible)! I divided the groups of counties into their regional areas (South East, Midlands, East Anglia etc) and assigned each a colour, and then tackled the map region by region to avoid missing out any counties. I was amazed, delighted...and also slightly appalled, that to complete a map that required so many different Liberty prints, I only had to send away for two pieces. 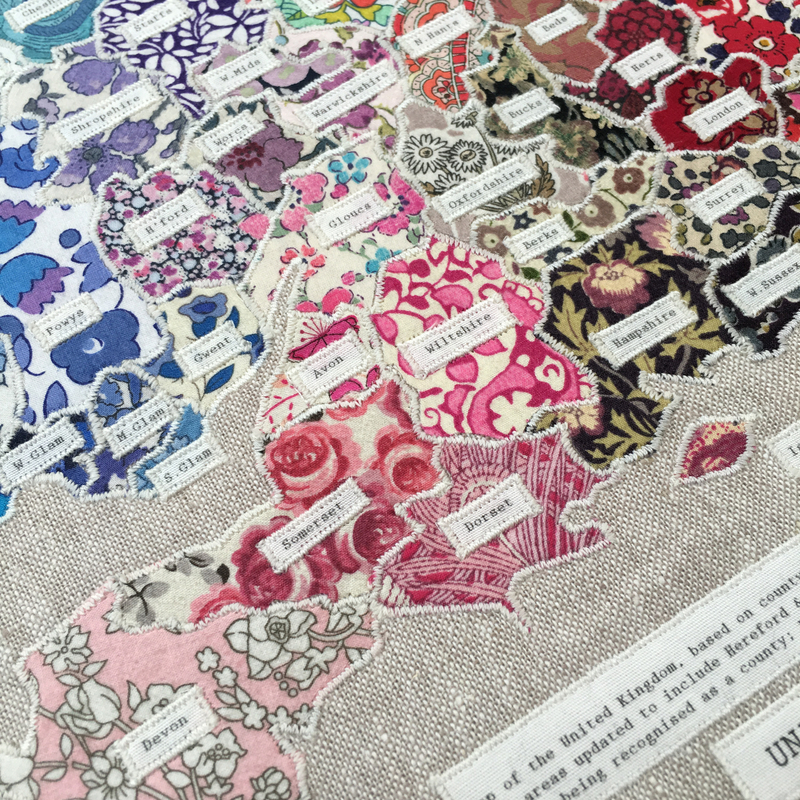 Luckily, Duck Egg Threads sells Liberty prints in fat sixteenths, for just £1.38 a piece! 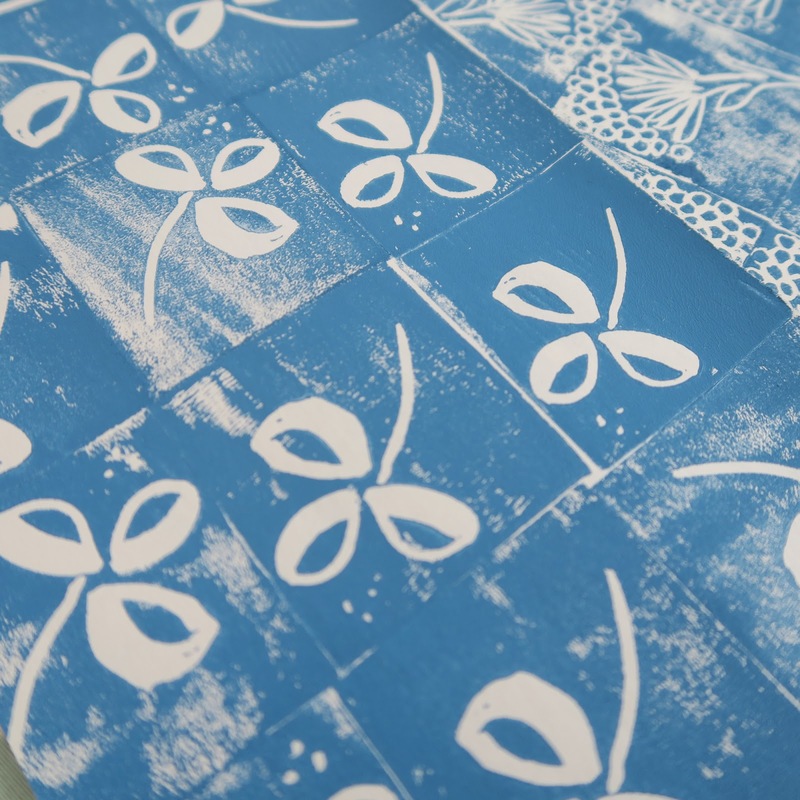 It's a really economical way of stocking up on a good range of prints for a project that uses tiny pieces like this. 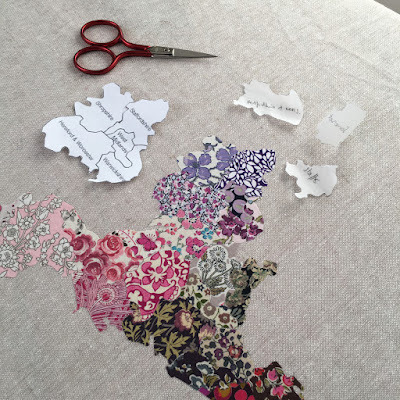 When you use an iron-on fusible for appliqué, you have to use a mirror-image of the shape, so that it will be orientated the right way on the front side. 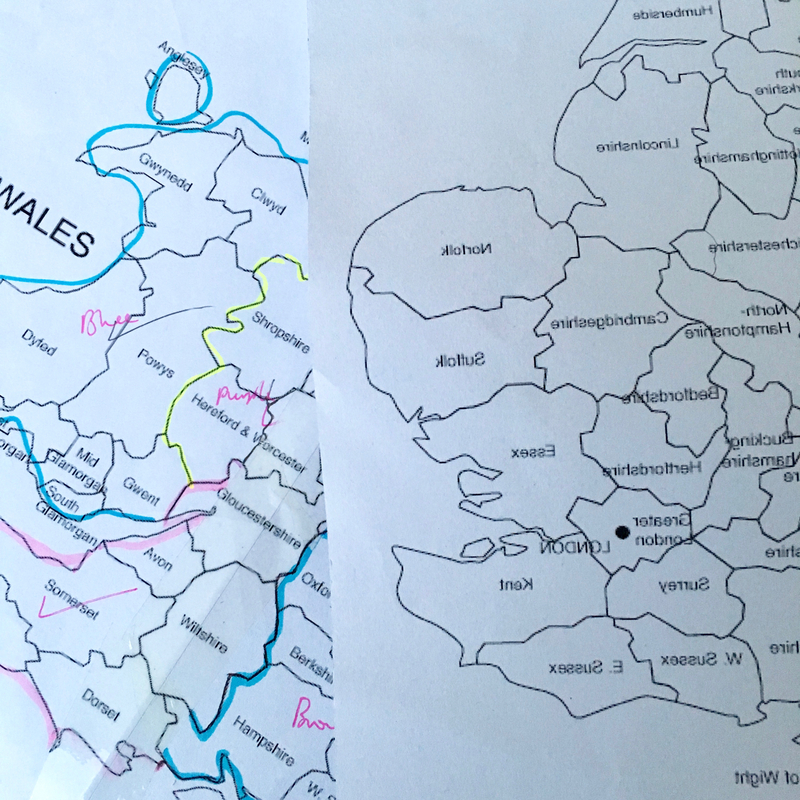 For this, I printed out a mirror image of the map I'd chosen to use and then traced all the counties from that map. I also kept a regular copy for reference and marking things off as I did them. 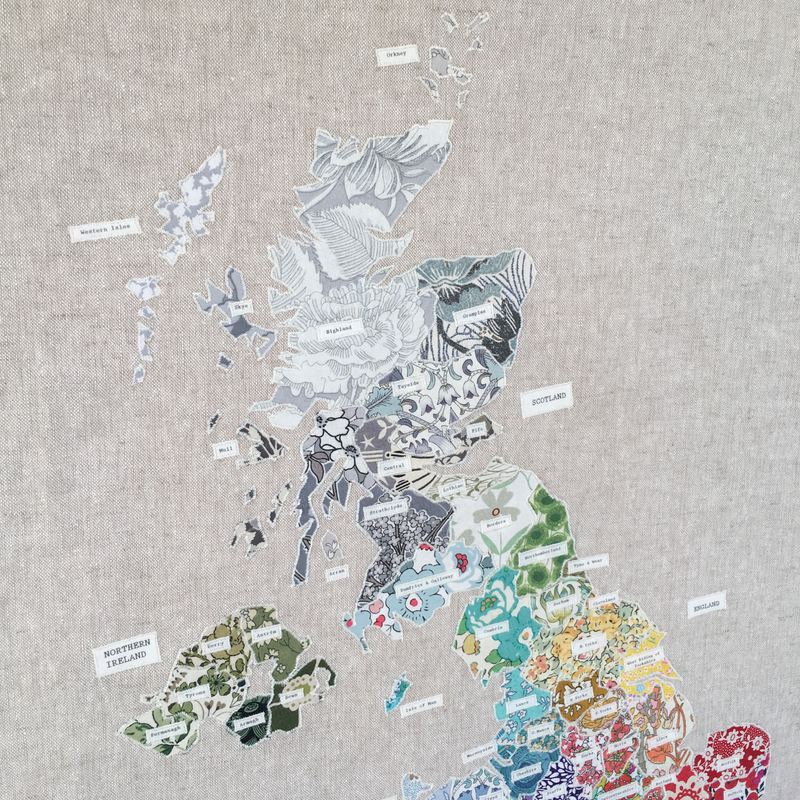 Once all the counties were cut out and ironed on (I love it when what felt like nine million hours of cutting and sticking, is later reduced to ten words), I then appliquéd it all into place on my machine. 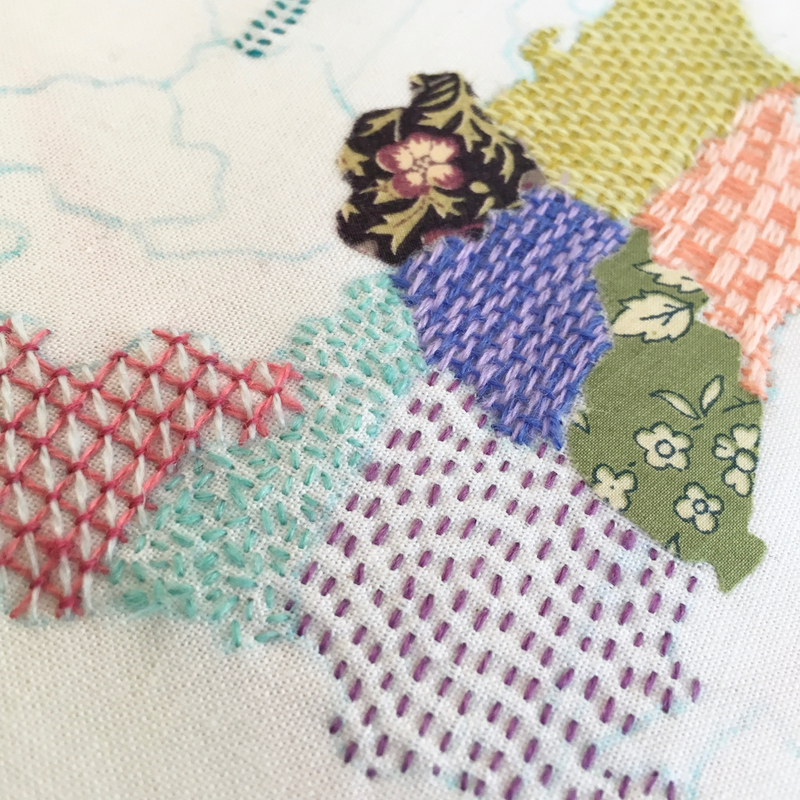 I decided to use the same thread colour all over to give some cohesion, and also to use a really narrow satin stitch, so that the lines defining the counties didn't feel too heavy. 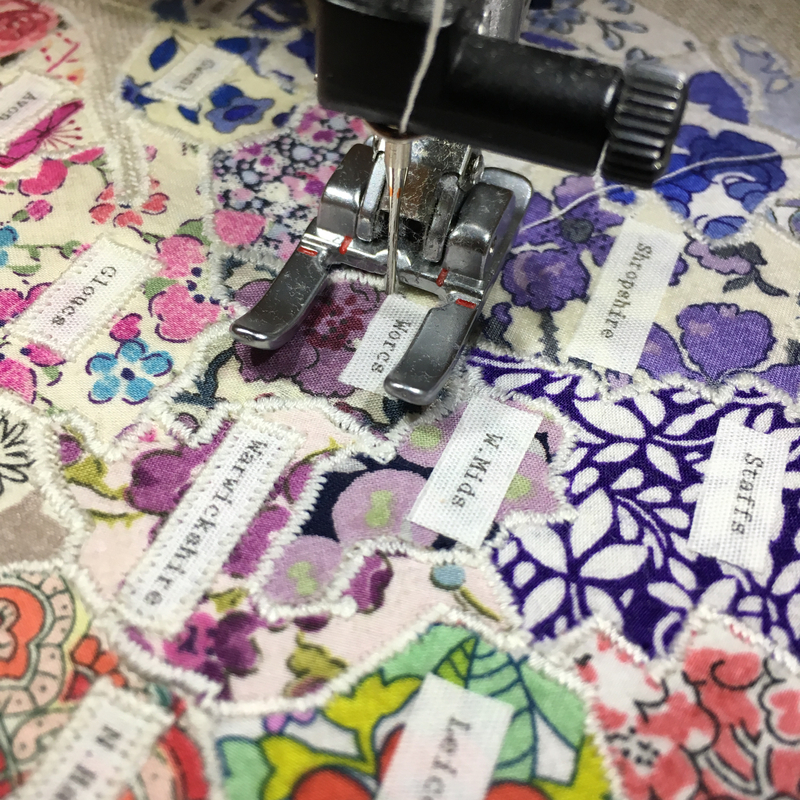 While I'd been appliquéing, I'd come up with the idea that I could print out county names and then appliqué those on too. I wrote up the names using a lovely old typewriter font and printed them onto creamy-coloured plain cotton backed with fusible web, cut perfectly to an A4 size. My printer only objected a little to this pseudo-paper and eventually agreed to print out a full sheet of names without any smudges at all. You can see them being appliquéd in place above. I wanted to tell you quickly at this point about this awesome seam ripper that I've had for a while now. 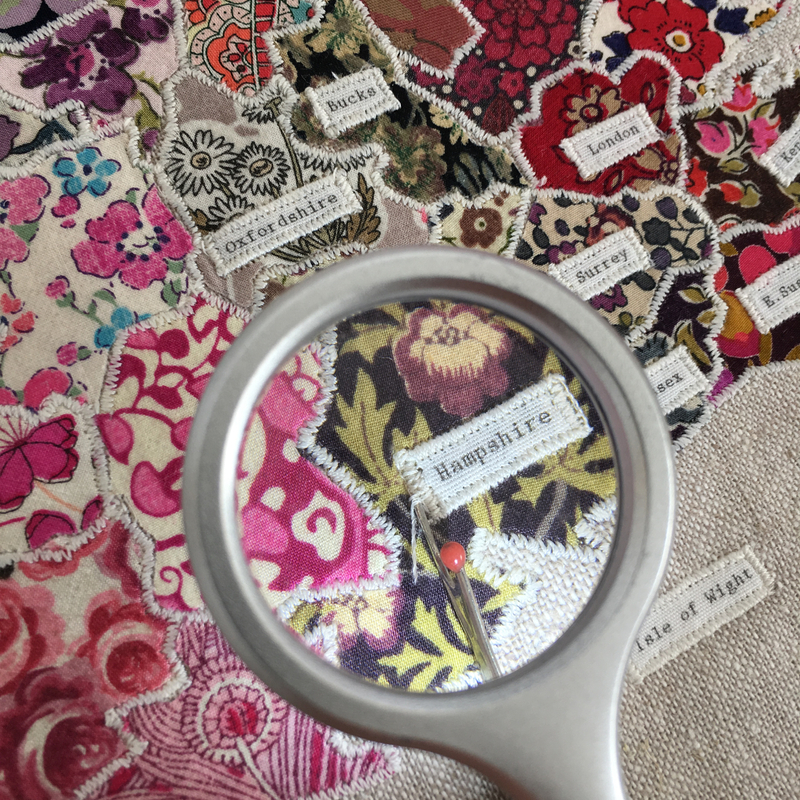 It has a magnifying glass attached to it, along with a very powerful light, and together it makes light work of unpicking even the tiniest of misplaced late-night stitches. Particularly in low light, my eyes are really starting to struggle, so this is invaluable. 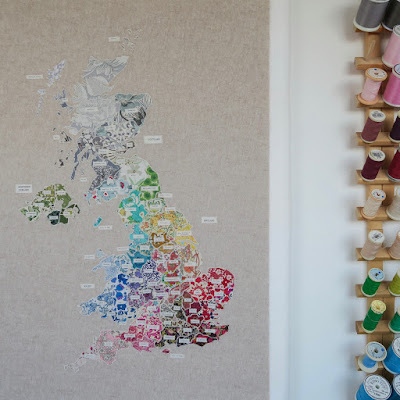 One day, when my father popped in, I took him up to my sewing room to see what I was working on and he broke it me that some of my counties seemed to be missing! He was pained by telling me this, so I felt awful for him, but when I looked, I realised that Rutland was indeed missing and several other mapping crimes had been committed. 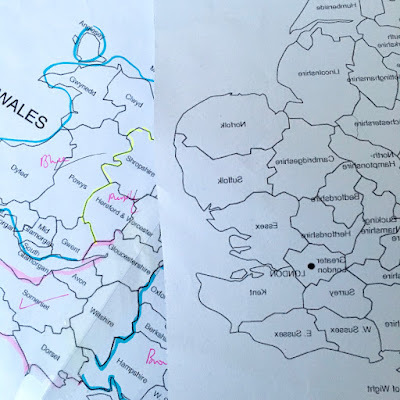 It was then that I started reading up about county divisions and discovered that counties have been redefined regularly throughout history and that those on the map I was working from were only correct between 1974 - 1995. I did mention earlier that I'm better at eating cheese than answering quiz questions, so you can see how this oversight might happen. But either way, it was most unwelcome news. But do you know, when I checked around (obsessively), I found that half the country isn't aware of this and that there are all sorts of places where incorrect maps are still being shown on official websites...quite something when the internet wasn't really in full swing until well after this map became outdated. Some things I decided to leave as they were, but I knew that it would really bother me not to include Rutland, our smallest county, so I did some surgery and I think it was fairly successful. Also, I felt traumatised not to have all the Yorkshires labelled correctly, because my maternal grandmother had grown up in South Yorkshire (although she would have found it really funny), so that too was updated. 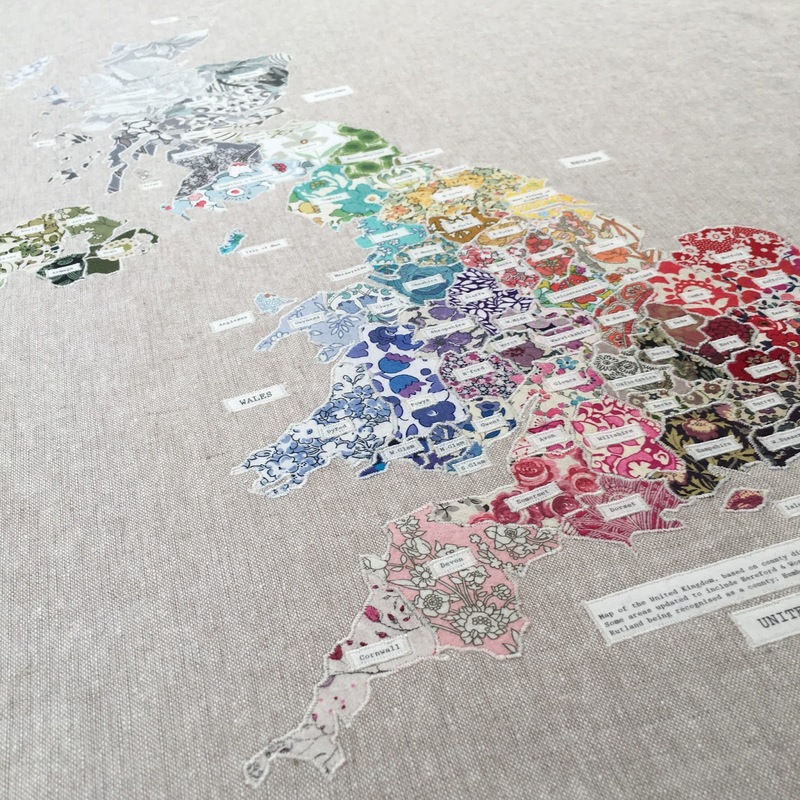 I then typed up a little note that read 'Map of the United Kingdom, based on county divisions between 1974-1995. Some areas updated to include Hereford & Worcester as separate counties; Rutland being recognised as a county; Humberside becoming West Riding of Yorkshire.' I appliquéd this on and felt quite relieved that I'd catalogued all the inaccuracies...although my husband thought that my need to do this was absolutely curious and that it should be taken off. It was. UPDATE: It seems this is a map that's going to need a larger frame, just to hold the correction notices that could be placed beneath it...it's come to my attention that I meant EAST Riding of Yorkshire...not West Riding. Looking at it now, I have no idea how I didn't notice my mistake or then pick it up when very carefully [incorrectly] notating the first fault. I'm going to bury my sorrows in a large piece of White Cropwell Bishop Stilton and then sort it out at a later date, once I've relocated a modicum of trust in my own mental faculties. I could be some time. (My father introduced me to white Cropwell Bishop when we visited a cheese counter together last weekend. If you see it, get a piece - it tastes like a cross between Stilton and Wensleydale...tangy, creamy but crumbly at the same time. Perfection). 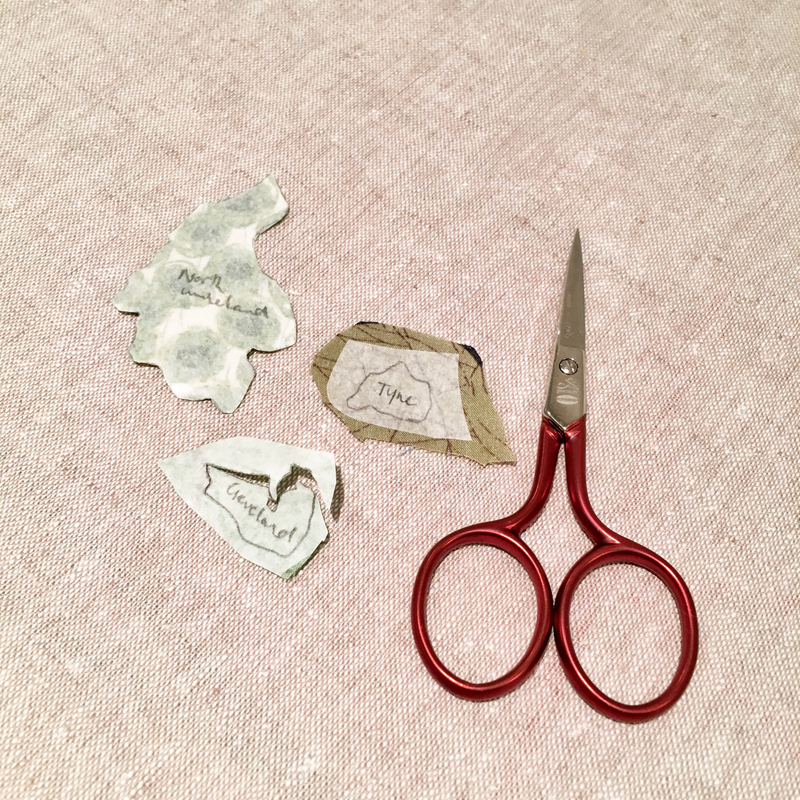 UPDATE part II: Although I'm going to change the issue mentioned above, I'm not going to attempt anything else as it would probably ruin the map to do so - it's tricky to successfully unpick dense satin stitch and remove fabric that's been heat-fused without everything falling apart. Although I appreciate from the comments section that there are people who feel passionately that accuracy in these matters is important, I'm going to bury my head in the sand and enjoy my map simply as something that I loved making, which happened to be based on an outdated map, with a few of my own inaccuracies thrown in for good measure. It makes me really happy that Scotland (also underrepresented in counties back in 1974...it's now divided into many more pieces) is depicted in beautiful icy shades of grey, which feel like they capture the temperature of Britain's most northerly point...I later wished I'd graduated the colour on this basis across the whole map. It's now being framed and should hopefully be on a wall soon. It's really hard to photograph because it's so tall and thin...it just seems to disappear in pictures, but I think if you click on them you'll get a bigger version, if you'd like to see any close up.